Martlets goaltender Tricia Deguire was a brick wall against a Concordia Stingers offence that struggled to find its groove. Once again, the Maroon and Gold were shutout 3-0 at Ed Meagher arena on Saturday afternoon. The first-year netminder and Réseau du sport étudiant du Québec rookie of the year stopped all 24 shots directed towards her in game two. She denied Concordia 43 times over the course of six periods. With the win, McGill captures its 14th provincial championship and defeats the Stingers for the first time in the finals since they met in the deciding game in 1997. Concordia went on to win the women’s hockey national championship that year. The Martlets celebrated on the ice once the buzzer sounded off. Naturally, the Stingers weren’t as thrilled as their crosstown rivals. Still, they felt proud about their work ethic. With their backs against the wall and the possibility of elimination looming, the Maroon and Gold started the game with energy—something that was lacking in game one. The Martlets struck early in the first period. Rookie forward Marie-Pascale Bernier was serving a two-minute minor for body checking and forward Gabrielle Davidson scored 4:46 into the period to give her team the lead. 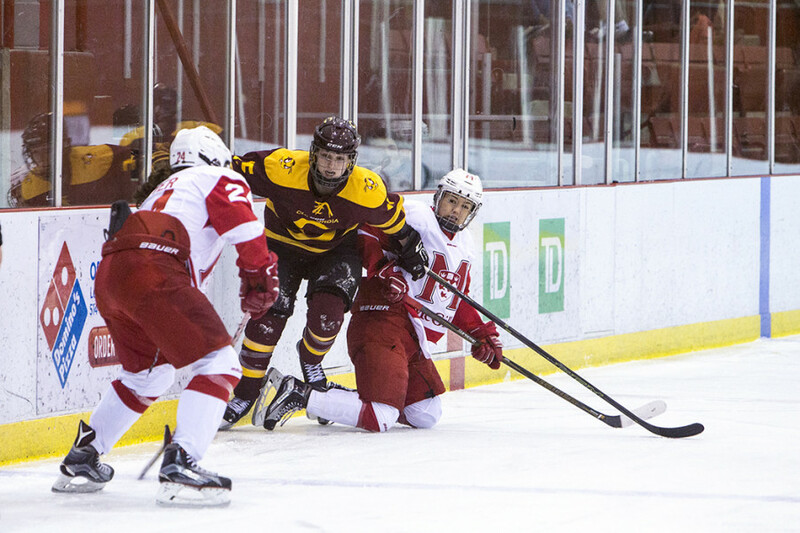 The Stingers, down by a goal, were given a golden opportunity when McGill’s first-year forward Jade Downie-Landry took a four-minute penalty for jabbing another player with the end of her stick close to the halfway mark of the first period. While Concordia swarmed the zone, the Martlets penalty unit blocked most of the passing lanes through the middle, thereby limiting the Stingers shots to the outside circles. McGill successfully killed the penalty and with less than five minutes left in the period, forward Olivia Atkinson added her fifth goal of the playoffs and doubled her team’s lead. Concordia played their best hockey in the second period, outshooting the Martlets 14 to six. Yet, it was McGill who managed to find the back of the net, as forward Shana Walker maneuvered her way past the Stingers defense and placed the puck top-shelf to triple her team’s lead. The Stingers were given another power play opportunity when Olympian and Martlets’ captain Melodie Daoust was sent to the sin bin for tripping. Concordia, who scored five of their nine goals in the first round of the playoffs on the powerplay, were unable to score with an extra skater. Concordia’s woes continued well into the third period. The team only managed to get one shot on goal in the last twenty minutes of the game. The Martlets were hungry to add to their lead and maintained strong puck possession all the way until the final buzzer. Goaltender Katherine Purchase, who made 22 saves on 25 shots, said that her team tried to remain positive but were naturally unhappy with the quick end to the series. 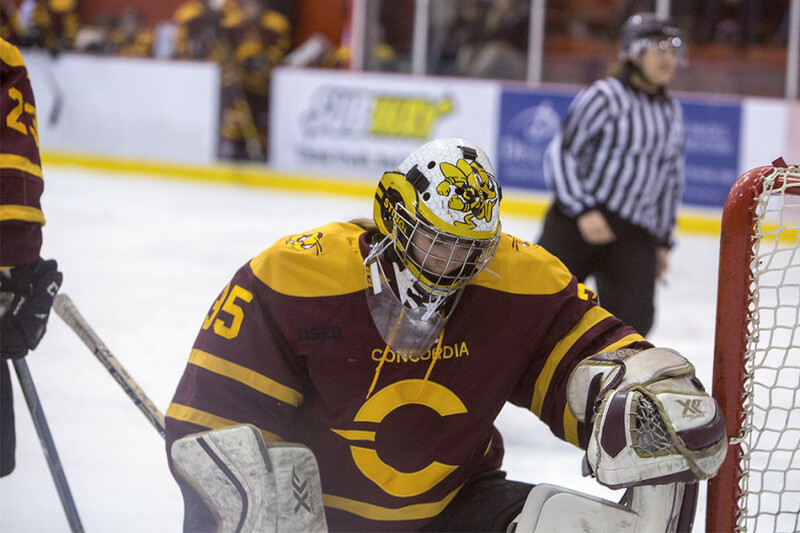 Fourth year Stingers Caroll-Ann Gagne, Marie-Joelle Allard, forwards Alexandra D’Onofrio and Ann-Julie Deschenes may never see the Ed Meagher ice again as Concordia players. That’ll depend on whether they decide to come back for their fifth and final years of eligibility. For fifth-year player and captain Lavigne, it was certainly her final game on home ice. However, she didn’t put much thought into it. “[I was] a bit [emotional] but not too much because I know we’re going to Nationals so it’s not over yet,” she said. Indeed, the Stingers will have the chance to redeem themselves in Napanee, Ontario where they will play in the U Sports Final Eight National Championship tournament, which begins on March 16.